I have taken video updates of the products, as I started the tests, a few days later, a few weeks later and a few months later. Here are the quick links, Part One obviously is the application. Part Two is the results. Before I start, I am very open to ideas on how to test these products out. If you have any ideas or suggestions please, please let me know via the contact me menu at the home page. It’s in my interest as well so I am up for suggestions. I may even mention you, (if you want me to that is). Battle of the Titans of rust killers! Yeah, I know it’s a big statement to make but I believe its justified. A long time ago I had an old car that had rust on its front wing under the aerial. I went to the bigger UK car parts store to gt some rust cure. I went in and there was this little pot of stuff that will rid me of rust. I bought some and paid a princely sum of £1.99 (yep – it was that long ago). I took the aerial off, sanded down and done what it said I should do. I painted it on and it sort of went brownish colour and dried. Great, I filled the hole and primed and painted. A month or so later the tell-tale needle bubbles were there and the brown stain on the paint. It was back. It was rubbish. Since then I have been so cautious of the “rust treatment” hype. I now have an old classic car that has rust, not bad rust granted and in fact its pretty damn good for her age. I need to treat things and I want it stopped. I have been looking and studying the Rust products for a year or so now. they all promise the same thing and they all get very different results if you read the reviews. Now for the non-visible side of this I use POR15 paint, this is a 3 step process and takes a while. It seems to brilliant stuff. But, you can’t use it on the outside bodywork as a base coat. I emailed POR and they responded with “we don’t recommend it”. In other word your car will look rubbish if you do. Enough of POR that is a different product altogether but I thought I would mention it. 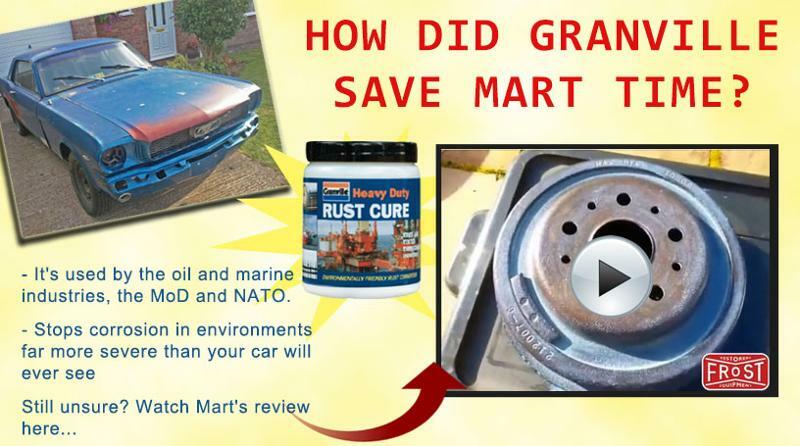 I have reviewed the Granville Rust Cure on this blog (click here) and Frost have used it as well for their promotions. I will review the FE-123 very soon as well and place that on here. You can go to my YouTube channel to see Granville in action on video. I will post another video of the comparison when I get more results. The prices are near to each other as you care to mention. The Granville does come on a smaller pot than the Rustbuster so could be cheaper if you a smaller amount but it’s a proportionate amount of the cost. You save because you buy less. They look identical, they even smell the same. The difference of the products are to be around the application and the long-term results. The link to the PDF above for the Practical Classics results I don’t think was entirely fair. Let me explain; The results were in favour of the Rustbuster as it won obviously. But their information is incorrect, they (being Practical Classics) mentioned that the Granville had to be used with two coats in “quick succession”. I don’t know where they got their information from but the back of the Granville clearly says apply a second after 12 hours! The time involved here could be an issue if you have to paint quickly. On the other hand, why would you be rushing these things. I always leave double the time to dry, just to make sure. Secondly they mentioned you need to work outdoors due to the smell, now my nose has been abused over the years being in the print the solvents were horrendous. But, they both did not smell that bad and I have used in the house up the kitchen table painting small parts with the Granville and the wife didn’t complain about the smell. (Only complaint was the mess I was making and the fact I was doing it up the kitchen table). Thirdly both solutions apply the same, they don’t run of vertical surfaces and they stick very well. Both need rust there in order to work. The Granville does however tend to produce bubbles on my review. These can be calmed down on the nearly dry stage were the brush dragged over the bubbles will remove them. Yes I moan about it, but I think I have now got the “knack” of doing it. In my tests I have deliberately left some bubbles there to see what happens. The Granville Rust Cure does to go to lengths on the pot to explain that this product should not be stored in the frost. The Rust Buster makes no recommendations. Due to these inconsistencies by Practical Classics I wanted to test my own things/theories out. What and how did I test? I found an old inner fender splash guard that has rusted up big time and is no use to me as the rubbed barrier to the fender has all but perished off. On this piece of metal I would paint a couple of strips very similar places. I also got a couple of long nails and tried a couple of things. The nails were allowed to rust up. This happened in a matter of days of laying in the wet grooves of the splash guard and dry out in the sun. No artificial ageing, just a sunny patio area and exposed to the elements. On one of the FE-123 nails I painted it at the point end first to see if would prevent the rust in the first place. So these tests were slightly different but it was what I was interested in doing to see if would prevent. No changes as yet, The bubbles on the Granville Rust Cure are still evident, but going away. At this point the FE-123 does feel the smoother of the two. But the rain seems to run of the Rust Cure easier. 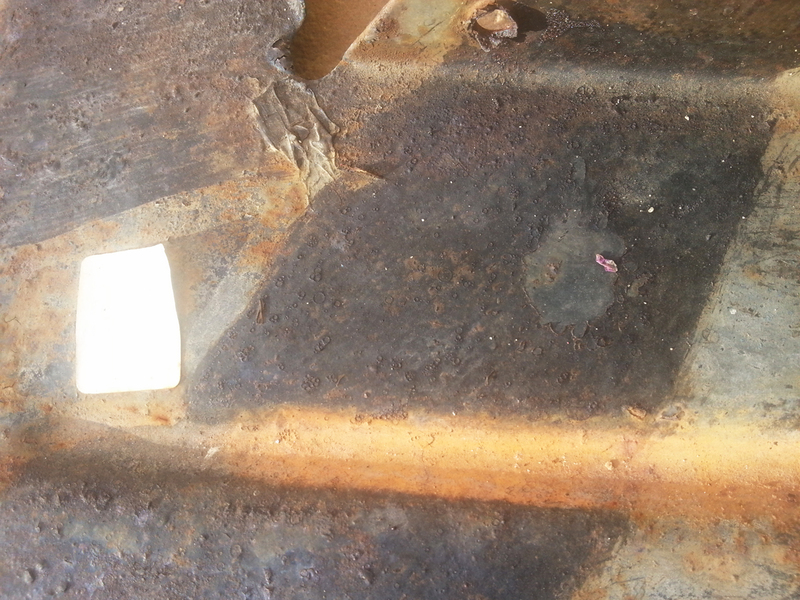 Pre Treated nail has not allowed the rust through, and the rusted nail has not allowed more rust back yet. Things are starting to happen on the tests. Just after I had let the products dry and cure I decided to scratch a small patch on the treated areas. The reason is that the Granville could be scratched off when knocked or damaged. I scratched a small patch on both products to see what would happen. The Granville so far has not lifted up and no rust has penetrated. The fe-123 has lifted up along with a cracking part which has happened on its own over the short space of time. Here is the close-ups of the fe-123 flaking up. The fact I could pull it up with no effort is a little worrying. I have had a close look and so far I can’t see any rust coming through. I will keep a very close eye on the progress. It’s not looking to good for the fe-123. However this may only be cosmetic, we shall see. Things are starting to happen and it don’t look good for the FE-123. I have noticed that some very small rust spots have turned into much larger ones. The flaking on FE-123 is horrendous and the coating is showing signs of cracking on its own accord. I have ringed the worst parts and also pointed some of the patches out. Nothing has been done to this test plate apart from being left in the sun, rain and everything in between, even the odd touch of frost. I believe that I have my own answer to the testing but I will just continue with the test regardless. The right hand side of the test strips are the FE-123 and the left hand side is the Granville Rust Cure. All the pink markings are on the FE-123 at this point. For consistency I have marked up the scratched surface on the Granville, you will note that it is not flaking up and shows no signs of the rust coming back. Fe-123 goes from Bad to Worse! Nearly twenty days later and the rust is starting to come back with a vengeance on the FE-123. The Granville Rust Cure by comparison shows no additional rust. I have pretty much proved it to myself and anybody who is looking that the tests results speak for themselves. I have taken some real close up versions as I can in the pictures below. There are now additional areas of flaking appearing on the FE-123 that I have not touched and just left it alone. Would this happen if it was under paint? I don’t know to be honest. But it worries the hell out of me if it is even considered that it might. When you spend thousands on a paint job and it peels up because of the this stuff I will put the bill to Rustbuster I am afraid to sort it out. What is interesting here are the nails. The nails were coated half way down when rusted and the other before it had started to rust. The nails are holding up OK. I suspect that the reason is that the rust did not eat into the metal as much as my test piece of 47-year-old splash guard has. I am more worried about the rust on the old metal at this point. So here is the evidence. Rustbuster FE-123 below with the areas marked up. where the rust is showing and the flaking areas. Here is the evening sun on the FE-123 close up. As you can see I didn’t need to mark anything up as the evidence is clear to see for yourself. I have taken another video of the comparison and posted it on YouTube to see for yourself. Am I ready to pass judgement on the side by side products? Well Yes and No. Yes, because the evidence is clear to see that the Rustbuster has failed to withstand the natural elements of my garden. The Granville has been subjected to exactly the same elements and conditions and yet it shows no evidence of the rust. No, because will the Granville suddenly explode with a torrent of rust? To be fair I don’t think it will, but I just want to know what its limits are, if that makes sense. I am bitterly disappointed with the Rustbuster as I don’t believe it does bust the rust at all. I was hoping that the FE-123 would win the battle of the giants. Why? Well it’s a one coat process and didn’t seem to bubble like the Granville. But saying that the FE-123 does leave brush marks which is clearly visible. 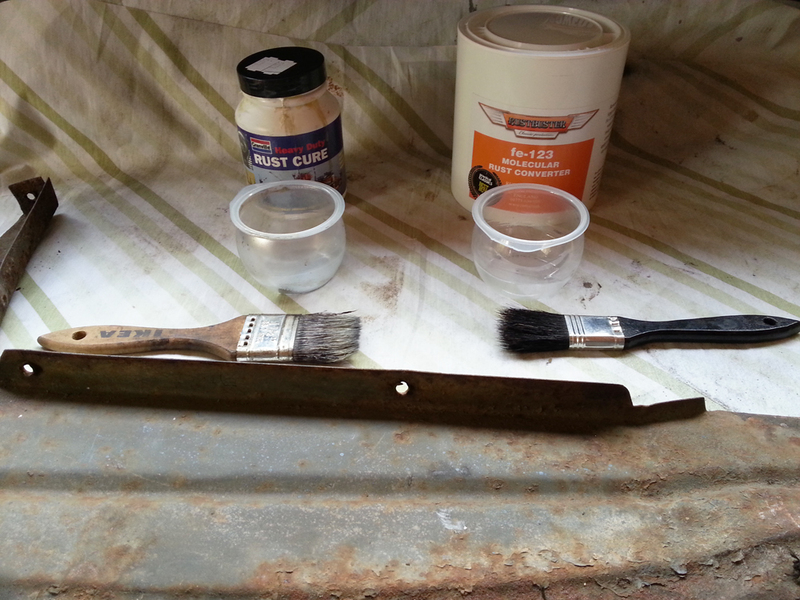 Now I am going to use the Granville Rust Cure where it matters. So, to the Practical Classics results, nobody has posted pictures of the results that I can see, has anybody seen them at all? There has been no updates from what I can see on the tests that were performed. I would love to be proved wrong, but I don’t think so somehow. I will continue to leave the splash guard out in the weather elements where it has been for months now untouched. I will continue to update this page when I think of it or I see something happening that needs a mention. I’m not sure why I am putting this here but I thought I would cover my own back. The results are my own tests which I have performed. Both the products have been submitted to exactly the same treatment and conditions. I am happy to provide the testing splash guard for inspection to the companies in question if they want but it will not be at my expense. I have nothing to hide and I can only speak from what I have seen. I would advise anybody to seriously consider what and where they will be using the products and I hope my results are a guide only for reference. This was not a laboratory test in controlled conditions. It has just been left out in the sun, rain snow, hail, frost or anything in between. I do not know much about Granville Rust Cure. But I saw how fe-123 is used and its results after months (by the way I am not associated with CM, and I am no in UK). In your article there are two issues. My understanding is that CM applied two runs of Granville in order to make a solid seamless single coating, which can only be done when you do the two runs in quick succession. This is not inconsistent with 12 hours’ instruction on product label. Acutally when I, and perhaps most painters, do painting with multiple runs to form a solid uniform coating. 2. In you test you deliberately scratched an open patch to both Granville and fe-123 coating. And this is to be a fatal wound to whichever product that completely seals off the metal. Because that patch would induce a much higher electrolytic potential that foster rapid rust. That is why you see the rust on fe-123 part went ‘revenge’. And that in turn proves fe-123 does seal rust tighter than Granville. I believe CM did a fair test. Thanks very much for the response and I genuinely appreciate the feedback on such a difficult matter of Rust. there is so many variations on the market and anything that discusses the issues is welcome by me. 1) The instruction clearly state apply two separate coats, it is irrelevant if it’s done another way to look pretty or not, If you don’t follow the instructions then the test is not fair on the product. They masked of the areas as did I to apply the treatment. this will give a clean edge. What I meant was that I noticed the FE-123 was starting to lift and peel on its own. I scratched BOTH products in the same way and both products have always been treated the same. Also I treated two areas of the same metal for each product and I only scratched one section of the products and leaving the other section alone. Still the FE-123 still let the rust through which shows it did not seal as well and the Granville. these separate areas are clearly marked out and are there for you to inspect. The FE-123 cracked and peeled on its own BEFORE I started the scratch test, the photos above clearly point out the FE-123 own flaking which was not on the scratched area. In fact I think it’s a fair thing to do, if I treated an area and it gets scratched and it rusts worse than before I want to know about it. If the FE-123 is on a part of the chassis where it could be damaged then I will be making things worse by what you are saying, is that not the case? I have not tried to replicate the tests that the magazine done that would be pointless, these were my own tests from my point of view. I still challenge the magazine to show the results as I have done here. In fact I should do another update on the results and the FE-123 is looking very much worse for wear unfortunately, perhaps I will do a 1 year on update as the metal is still where I left it untouched for many, many months now. I said from the beginning I really wanted the FE-123 to work for me, but unfortunately it wasn’t as good as the Granville. I am using the FE-123 in out of the way non-critical areas to use it up. But the Granville will take the bulk of the important work. These were my own tests that I wanted to do, not some lab controlled area. The rust appeared on the FE-123 before the Granville did on the scratched AND unscratched portions of the metal. The fact the unscratched area of the FE-123 showed rust can not be explained by your “electrolytic potential” theory. The test by the magazine own article said applied in rapid succession but this is not what the instructions say, leave time is the instruction set. I am open minded about this and maybe you are correct, but I can only report on my findings on what I wanted to know about the products side by side. The best of all these products by a LONG way is the POR15, which is my priority if you look at the blog and the areas I have treated that are open to the elements that nature can through at us. If you want to stop rust – use POR15. I do not work for Granville, or Rustbuster or POR15 come to that. I am just a bloke trying to understand what is going on here.